South Africa has an astounding array of bulbs in various plant families (the most species of any country in the world), and many of these are grown in gardens around the world, including the Ruth Bancroft Garden. An outstanding example is Veltheimia bracteata, native to coastal scrub vegetation in the Eastern Cape Province, which is located in the southeastern part of the country. 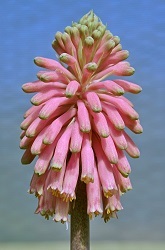 Veltheimia is a small genus in the Hyacinth Family (Hyacinthaceae) with only two species, the second one being Veltheimia capensis, from farther west in the winter-rainfall region. In contrast to its western cousin, Veltheimia bracteata receives rainfall in both winter and summer, but it is adapted to growing in the cooler winter months. It may be briefly deciduous in the heat of summer, but this depends on the growing conditions. 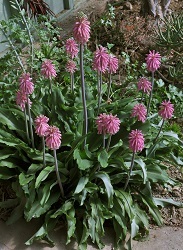 Veltheimia bracteata is clump-forming, with new bulbs added year after year. The glossy green leaves are up to 1½ feet long (a little less than .5 m) and 3 inches wide (7.6 cm). They have wavy margins and arch to the side. Plants are in active growth through the winter months, and the flowers emerge in late winter to early spring. 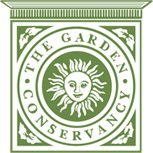 At the Ruth Bancroft Garden, the flowering period is usually in March to April. 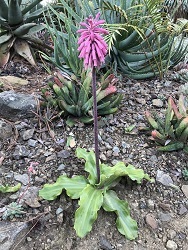 The flower stalk of Veltheimia bracteata rises to a height of up to 2 feet (.6 m), topped with a dense cluster of slightly curved tubular flowers. Each flower is 1 to 1½ inches long (25 – 38 mm). The buds are initially upright, then arching outward, and finally nodding downward by the time they open. The flower color is usually some shade of pink, from pale-pink or lavender-pink to deep rose-pink or coral-pink, but there are also pale yellow or greenish-yellow forms as well as white. The tips of the buds are typically greenish, and the open flowers are lighter at the mouth. On close inspection, it can be seen that the flowers are speckled rather than of a uniform color, but the pale yellow and white forms lack this speckling. If successfully pollinated, the flowers give way to large papery 3-winged capsules containing the small pear-shaped seeds. Veltheimia bracteata is easy to grow if given light shade and good drainage. For a tropical-looking plant, it has surprising cold tolerance. With the protective cover afforded by an overhead tree canopy, our plants at the Ruth Bancroft Garden have come through cold spells of 27° F (-3° C) without harm.